Remote monitoring of data centers and server rooms is a vital component for maximizing network uptime, reducing running costs and enhancing IT performance. 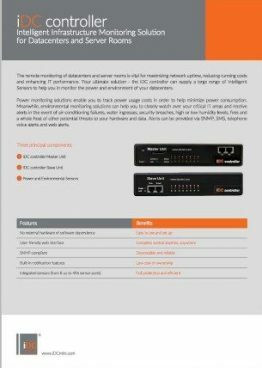 For a total solution of iDC Controller can supply a large range of Intelligent Sensors to help you in power and environment monitoring of your data centers. Power monitoring solutions enable you to track power usage costs in order to help minimize power consumption over time. Meanwhile, environmental monitoring solutions can help you to remotely watch over your critical IT areas and receive alerts in the event of air-conditioning failure, water ingress, security breaches, high or low humidity levels, fire and a whole host of other potential threats to your hardware and data. Alerts can be provided via SNMP, SMS, telephone voice alerts and web alerts.